Brownie mix hacks that will leave everyone begging for ‘just one more’! Baking from scratch is ideal but it’s not always possible between work, swim class, soccer practice, cooking dinner, reading logs, homework sheets, bath times and … somewhere in there should be a little ‘me time’. But I have yet to find a store bought brownie that I like. The compromise? Brownie mixes. But not just any brownie mix. The super improved, extra delectable versions that come from a little fussing with the original recipe. Since the basics are done with the mix, all the extras are up to you! Sure, we’ve seen pieces of walnut, and even bits of caramel. That’s not new… How about chunks of cookies in the brownies? Oreo brownies anyone? Pieces of everyone’s favourite chocolate bar (always assuming your family can agree on this very important piece of information)? Crushed candy pieces, like all the leftover candy canes from the holidays, make a chocolate mint brownie with a little crunch. Marshmallows and graham cracker bits to make S’more brownies? The options are only limited by your imagination and what your stomach can handle! A truly sinful option? Easter cream eggs. There are only two words to describe that sensation: oh my! Or if you want to add a little texture, why not cover the top of your brownies with a layer of rice crispy treats? You get some sweet crunch with your brownie, quickly and easily. Brownies can become the receptacle for so many other flavours and if you bake them in a muffin tin, instead of a cake pan, you can easily add things after the fact. Example? Chocolate brownies with the centre pushed down or scooped out a little out after they’ve cooled and a little warmed up peanut butter spooned in and topped with one or two chocolate chips. Peanut butter cup brownies! Using a muffin tin will allow you to add things to the centre of your brownies too. Have you ever had banana stuffed brownies? Make your mix and add a little to each lined muffin cup. Then put in a slice of banana, about three quarters of an inch thick, into each cup. Top with mix and bake until a toothpick inserted near the edge comes out clean. Some people swear by adding beer instead of water, or dark cola. Me? I like the simple pleasures, like adding a tablespoon of vanilla extract. It gives the brownies just that little something extra. Adult brownies could include a tablespoon of instant espresso powder in the dry mix, for a mocha flavour. If you like chocolate mint, a few drops of peppermint extract added to the mixed batter will do the trick! Or my mother’s favourite flavour combination: chocolate and orange. You can get this by adding a tablespoon of orange zest to the batter BEFORE you add the egg and oil. Feel like something that tastes like a brownie, but looks like something else instead? How about brownie brittle? Combine your brownie mix with one egg, a half a cup of melted butter and a quarter cup of water. Spread this mixture on a parchment lined cookie sheet so it’s about half an inch thick. Bake at 350 degrees for 30-35 minutes or until the centre of the sheet is firm to the touch. Let it cool completely and then break it apart into brittle pieces! If you want to add candy decorations to the mixture, do it after it’s been baking for about five minutes, so they don’t completely sink in. Or how about a brownie milkshake? Mix a quarter cup of brownie mix with one and a half cups of vanilla ice cream, and a quarter cup of brewed coffee that has cooled. But it all in the blender and you’ve got a creamy brownie milkshake. Well, after reviewing all these idea, I’m inspired to head to the kitchen and whip up a batch of some chocolate brownies and try some brownie add ins. How about you? Do you have a favourite way to use a brownie mix? Try my brownie recipes: Halloween Brownies, Reese’s Stuffed Brownies, Easter Egg Brownies, Easter Mini Eggs Brownies, Caramel Bacon Brownies and Snickers Brownies. I used to love experimenting with add-ins when I was a teen. Thanks for reminding me how fun it is. Adding to my Pinterest queue. I’d love for you to join our link up To Grandmas House We Go. It opens around 11pm ET on Tuesdays. The Brownie Brittle sounds like something fun to try out! Brownies are awesome hmm, thanks for all these brownie hacks. 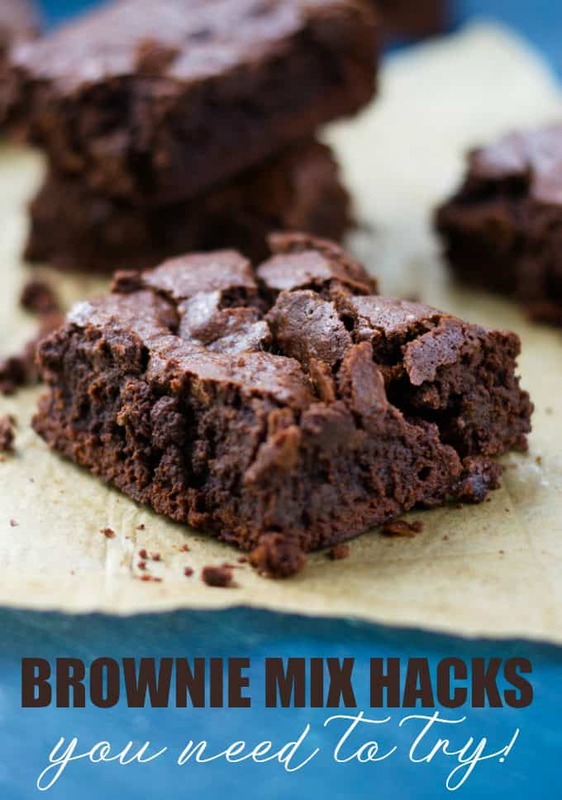 I love Brownie Mix and the hacks; so simple and easy to make something so simple, fancy. I love adding extras in my brownie batter making it something different each time. I just make brownies from scratch but not very often so these brownie hacks would add a little variety. I never thought to make brownies in muffin cups, I love that idea!